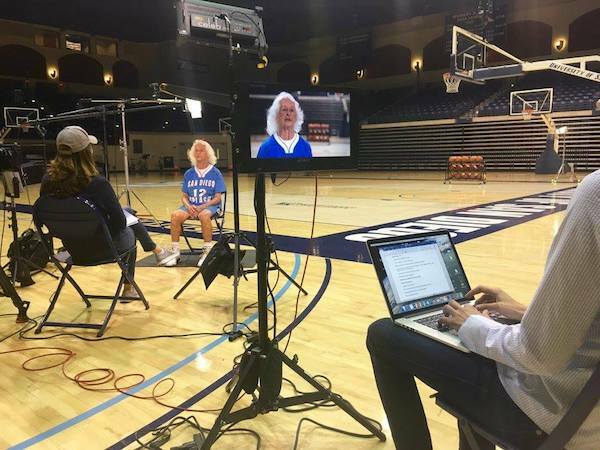 Michael Jordan has his own shoe, Maria Sharapova has a premium line of gummy candies and if you’re a Splash team member of the San Diego Senior Women’s Basketball Association (SWBA), you have Miracle Whip. 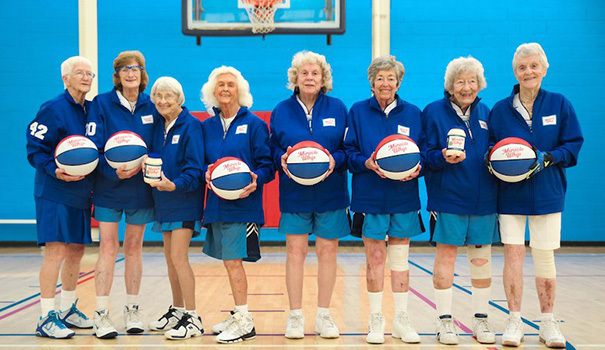 Splash is an SWBA team for players over 80 years old that has been featured by ESPN, NBC, The Huffington Post, Yahoo News and endorsed by Miracle Whip — an endorsement which they said “comes with a side of potato salad” on their Facebook page. This summer, Team Splash, along with other SWBA teams, competed in the National Senior Women’s Games in Birmingham, Alabama, where they placed fourth in their age division. All of this media attention is new for the players, much like basketball itself was new for 91-year-old Meg Skinner, a Splash player, when she founded the SWBA. In founding the league, Skinner had some help getting started. She was playing in a California Senior Olympics tennis tournament in 1992 when she was approached by David Hall, founder of the YMCA Senior Olympics, about starting a senior women’s basketball team. Although Skinner had never played basketball before, she arrived at the Mission Valley YMCA on the following Wednesday dressed and ready to play. To her surprise, however, no one else showed up. Skinner went back to the gym again the following Wednesday, and a third Wednesday, this time met by Gen Kessler and Willie Merriman, and the SWBA had its founding members. The trio began recruiting new association members by using local media. One of their new recruits Jackie Ives, who had never played basketball before, was photographed on the front cover of the San Diego Union in 1995 in an article that helped them grow from one team of three to the 15 to 17 teams comprised of 136 members they have today. Teams in the SWBA play half court, three-on-three games, practice individually throughout the week, hold pickup games on Wednesdays and Fridays, and compete within the association on Thursdays and Sundays. They say they only have two rules besides the membership fee: You must be at least 50 years old and of course, want to play. That’s right, no previous experience playing basketball is needed to play. Hall was active in the organized girls sports movement during the pre-Title IX era and was a physical education teacher before retiring. While she loved physical education classes and was active in her youth, she was unable to play on a traditional team because they simply did not exist at the time. 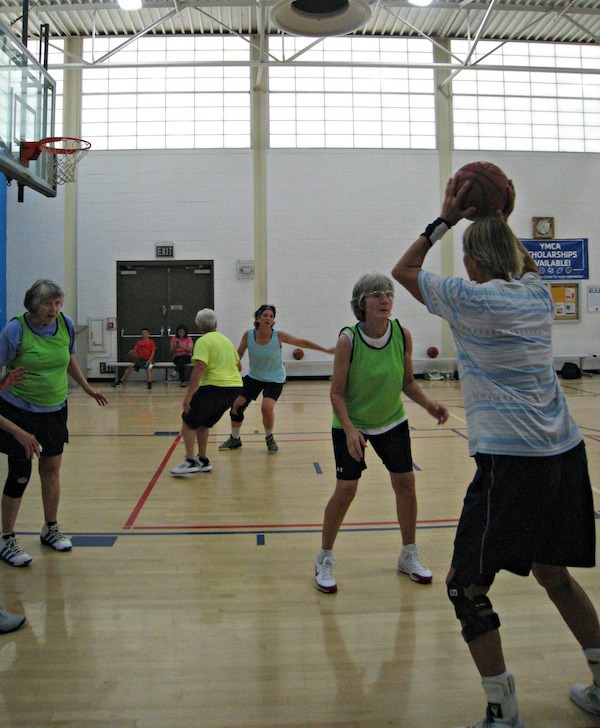 The association has teams for every five year age increment following 50 and the final team — Splash — is for players 80 and up, which provides a life-long membership for many of it’s members. For these ladies, SWBA membership is so much more than an outlet to play basketball. They go out together, have parties at their homes, go to the movies together, and truly share a sister-like bond. Something else that differentiates the SWBA and Splash from other basketball associations and teams is their rookie program. As a new member or first-time player, you can enroll in the rookie program to learn how to play three-on-three half-court basketball from other SWBA members. Also as a way to give back to the community, SWBA has registered as a nonprofit and they have a scholarship program to send young girls with financial need to summer basketball camps. “We get thank-you notes from girls who have gone to the camps saying they’re really excited and want to go to college and get their grades up and everything because of the college camps we send them to,” Meredith said. SWBA uses grant money and, most recently, money from endorsements, for their scholarship program which interested parties can apply for at swba.us.com. Senior women interested in joining the SWBA can apply online at tinyurl.com/y9rltznw or swing by one of their practices or games. —Jess Winans is an intern at San Diego Community News Network. You can reach her at jessicamwinans@gmail.com.